This month for our Wine & Dine dinner, we highlighted California Wine Country cuisine and enjoyed a few bottles of the most popular wine varietals from California's North Coast. It was a wonderful dinner with paired wines along with a great movie to tie into the night's theme. Below was our menu, along with a bit about the movie we watched involving California's Wine Country. To tie in with our dinner, friends and I also watched the movie, Sideways. It's a funny movie which touches quite a bit about the wine culture, from tasting, to various factoids scattered throughout and lots of beautiful wine country scenery. It definitely makes you want to learn more about wine too! I highly recommend this movie... and enjoy it with a glass of wine! What a feast you had! The mustard marinated shrimp looks like and flavorful and the eggplant rolls look decadently good. 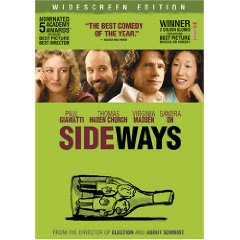 I love the movie Sideways; great characters and great wine. As always, everything looks great! I am definitely starring that bruschetta recipe, it looks delicious! What a fun party, everything looks amazing! I really want to try the goat cheese and spinach stuffed eggplant rolls - yum! Oh my goodness! What a great dinner. The shrimp looks really good, and I'm going to have to check out your recipe for the Cakebread chicken. I see it below. It all looks incredibly good. Wine and Dine night sounds like fun.